Since 1999, COOLDO specializes in accurate,verifiable,and transparent precious metal refining for many Chinese and overseas customers. We devoted to helping gold suppliers and jewelers to refine,recycle gold with safely and effectively way. Our induction melting furnace offer you what you need to refine gold in any kind– whether its scrap gold, old gold jewelry, gold coin,gold from mining, prospecting or gold of any other type.As a leading precious metal smelting and casting solutions provider, we continually provide a wide range of products to maintain our leadership in the market because of today’s great competition. Cooldo Gold Melting Furnace are mainly based on IGBT technology which are very popular in the jewelry making industry&gold refinery industry with their obvious features of fast melting, ease of operation and low loss maintenance. Our gold melting furnace equipped with multi-protective function, such as over-voltage protection, over current, over heating, less water protection, etc. Low fault rate, safe and reliable which can make the whole operation more smooth and safety. CDOCAST Platinum melting machine is a brand new product severally developed by our company, principally used in smelting precious metals, such as , gold, platinum,palladium or the alloys of those metals. This precious metal smelting machine can do a temperature of concerning 2600 degrees astronomer during a very short time (about 900 centigrade beyond the precious metal temperature ) . It adopts the foremost sturdy and lasting quartz pot within the market with a quick smelting time (within a pair of minutes). This type gold smelting furnace is specially designed with Temperature Control System,with the help of our PID Temp Controller, you can accurately control the working temperature of the whole melting process, our Temperature control error can be around 5 degree.With their low cost of ownership and maintenance, they are the most popular and reliable machines in the university lab and jewelry. This Type of Gold Melting Machine is deigned for small capacity melting 1-10kg, it is non-tilting type, which need to pick up by the crucible by tong, Based on the latest and most advanced IGBT technology which can gurantee the quality of the machine, the top speedy melting could be realized within 2-4 minutes. and our machine can working 24 hours per day.This is best choice for your gold shop and test for the mining. Coold Silver melting furnace with motor tilting system is designed for 30-50kg. 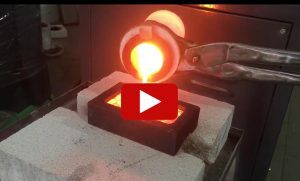 which is suitable for melting and making the precious metal ingot like gold,silver,copper etc. With speedy melting period in 3-5min per batch gained popular in market. When melting process is done, you just press the tilting button, the furnace body will turn over by the motor running.